Park County Colorado Land Sale – Cheap Land For Sale in Park County Colorado. Low Down Seller Financing and huge Cash Discounts on Wholesale Land For Sale. Park County Colorado Land Sale – During the formation of what we now know as Park County, Colorado, mineral-bearing water and lava oozed up and formed the Colorado Mineral Belt which runs from the Four Corners, through Breckenridge, and on to Golden and Boulder on the Front Range. Back in 1806 a trapper from Kentucky named Jim Pursley told the explorer Zebulon Pike, who was mapping the western land recently acquired by President Thomas Jefferson, than he had found gold in South Park. But, Pursley was successful trapping beaver and Pike had his mapping report to finish so nothing came of it. Then, in 1859, a prospector found gold outside of what would become Denver, and the Colorado Gold Rush was triggered. Within 18 months, the area to be named Colorado jumped from a few thousand Native Americans and a few hundred mountain men to over 30,000 people. About 1/3 of them settled in Park County where millions of dollars of gold was found over the years. Over time, the mining camps became towns and the homesteads turned into ranches. Then tourism took off with visitors coming to hunt, fish, sightsee, and pick flowers. Park County has changed very little. Many of the historic buildings, mining camps, towns and ranches are still there for us to enjoy. 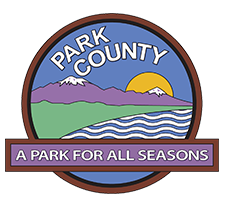 Park County is in the geographic center of Colorado, and only a short hop, skip, and jump from Denver and Colorado Springs. It is about 2,191 square miles and about 17 miles of which is water. Antero, Spinney Mountain, and Eleven Mile Reservoirs are the larger ones. Subsequently it is great for fishing and the headwaters of the South Platte River start in Park County are great for cutthroat, rainbow, brown, and northern pike fishing. The area is known for many scenic drives over Weston, Boreas, Guanella, Hossier, Kenosha, and Wilkerson Passes. Mosquito Pass is the highest automobile pass in North America. Park County, Colorado, gets around 16 inches of rain per year and around 114 inches of snow on average. On average there are about 246 sunny days per year. The average July high is around 75 and the average January low is about 4 degrees. Park County is a favorite place for many hunters and fisherman. It is also great for ATVs, UTVs, 4x4s and dirt bikes with lots of forest trails and passes to explore. There are historic hotels to visit in Fairplay, and also the South Park City Museum with an impressive collection of artifacts from the 19th century mining town. It is great for wildflower enthusiast, and bird watchers can gaze upon white pelicans, blue herons, avocets, sandhill cranes, ibis, and Canadian geese. Park County, Colorado has something for everyone. Check out our Park County Colorado Land Sale!